On July 27th, myself and a group of guys were hitting some softballs at the local high school for an upcoming tournament. I had started the practice pitching, then moved to shortstop before it was my turn to hit. One of the players did not have a glove so as I came in to bat, I threw my glove to him beyond the third baseline. 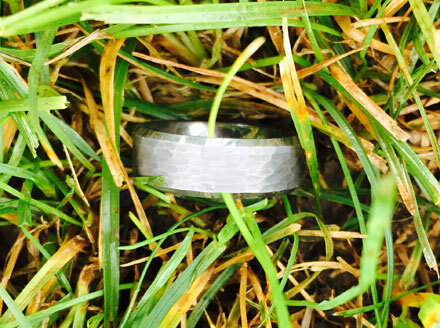 I took my turn hitting and after, returned to the field when I noticed my wedding ring was missing. I had recently lost some weight, and my ring hadn’t fit as well as it once had. My ring had come off in the past in my softball glove, but stayed inside the glove. However, not this time. In my gut, I felt that it probably fell out as I threw it to the other player before coming into bat. I was very nervous that I had lost my ring and would not be able to find it. Practice ended and for the next hour the team attempted to find my ring … but with no luck. After they all left, I went home to grab a metal rake which I had used in the past when I lost my ring once before. I stayed until dark, raking the grass, but with no such luck. I then returned home to share the bad news with my wife. I tried to fall asleep for hours, but couldn’t stop thinking about my lost ring. I began to search the internet for ideas on how to locate a lost ring. I then came across an ad for a guy who searches for rings with a metal detector. I sent him an email asking about the possibility of locating my lost ring. I followed up the next morning at work with a phone call. Later that day I received a call from Dan. I told Dan the story of how I thought I lost the ring. 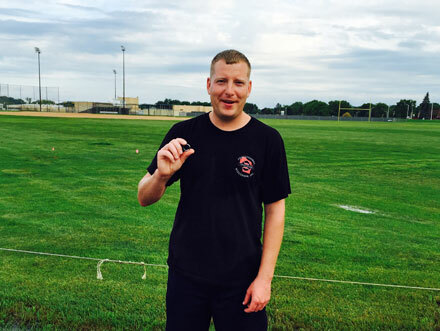 He thought he wouldn’t be able to perform the search until Saturday, due to the driving distance to Beaver Dam. I explained that I was leaving for up north that day and would not be around. Dan said that it was not an issue as long as I gave him a map to locate the lost ring, and that I could pay him at a later date. I thought he was very trusting as we never met and only spoke over the phone. Friday morning following the end of my shift, Dan called and said he would be able to come tonight to look for the ring before I left up north. I said I would meet him there. At the time he arrived, we had strong pouring rain. I pointed out where I thought I lost it. Dan reported that he was confident we would locate it. He had no problem looking for it in the pouring rain. After an hour of looking, the rain stopped and I felt hopeless. After the area was searched, he asked if the lost ring could have been somewhere else? I said it’s possible but I didn’t think so. It wasn’t but ten minutes later he located the lost ring with his metal detector. I was very thankful and appreciative. Dan’s professionalism, responsibility, and reasonable rates where more then I could ask for. Thanks again.